Does The Beyond Meat IPO Spell The End Of The Cow? It’s Thanksgiving week in the United States but we are feasting alternatively on acronyms here in Digestville. 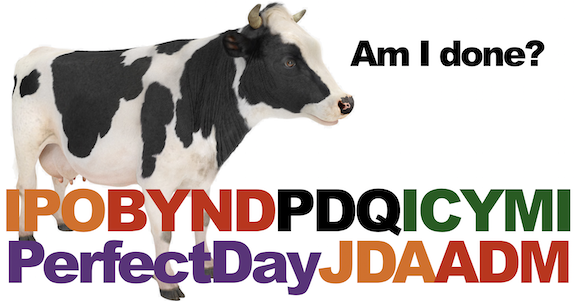 I.E., e.g., ICYMI, BYND IPO PDQ, and FYI Perfect Day AKA Muufri JDA w/ ADM.
As they said at Bletchley Park, let’s get out the Enigma machine and decode. In New York and California this week, the nutrition side of industrial biotechnology — and specifically, the “beyond the cow moovement is, ahem, mooving faster with news that Beyond Meat has filed for its IPO and Perfect Day has inked a Joint Development Agreement with Archer Daniels Midland(ADM) to scale up the production of dairy proteins using fermentation in microflora. Beyond Meat’s placeholder IPO target is $100 million and is supported by Goldman Sachs, J.P. Morgan, Credit Suisse, BofA Merrill Lynch, Jefferies and William Blair in the IPO. It’s combination of consumer shift, the industrialization of alternatives, and a successful foray into direct-to-consumer marketing. We believe that consumer awareness of the perceived negative health, environmental and animal-welfare impacts of animal-based meat consumption has resulted in a surge in demand for viable plant-based protein alternatives. A key analogy for both the approach to and the scale of our opportunity is the strategy by which the plant-based dairy industry captured significant market share of the dairy industry. In the United States, the current size of the non-dairy milk category is equivalent to approximately 13% of the size of the dairy milk category. According to the Mintel Report, the non-dairy milk category in the United States was estimated to be approximately $2 billion in 2017. The success of the plant-based dairy industry was based on a strategy of creating plant-based dairy products that tasted better than previous non-dairy substitutes, packaged and merchandised adjacent to their dairy equivalents. We believe that by applying the same strategy to the plant-based meat category, it can grow to be at least the same proportion of the approximately $270 billion meat category in the United States, which over time would represent a category size of $35 billion in the United States alone. As a market leader in the plant-based meats category, we believe we are well-positioned to capture and drive a significant amount of this category growth. We also believe there is a significant international market opportunity for our products. Perfect Day is one of a number of companies targeting “milk without the cow” — but theirs is a full milk replacement in terms of taste and mouth feel, rather than a plant-based milk alternative. Beyond Meat is one of the fastest growing food companies in the United States, offering a portfolio of revolutionary plant-based meats. They build meat directly from plants, an innovation that enables consumers to experience the taste, texture and other sensory attributes of popular animal-based meat products while enjoying the nutritional benefits of eating our plant-based meat products. The flagship product is The Beyond Burger, the world’s first 100% plant-based burger merchandised in the meat case of grocery stores. The Beyond Burger is designed to look, cook and taste like traditional ground beef. 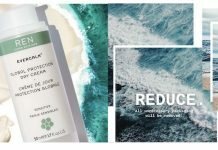 Our products are currently available in approximately 28,000 points of distribution primarily in the United States as well as several other countries, across mainstream grocery, mass merchandiser and natural retailer channels, and various food-away-from-home channels, including restaurants, foodservice outlets and schools. Instead of marketing and merchandising The Beyond Burger to vegans and vegetarians (who represent less than 5% of the U.S. population), BB requests that the product be sold in the meat case at grocery retailers, where meat-loving consumers are accustomed to shopping for center-of-plate proteins. We believe merchandising in the meat case in the retail channel has helped drive greater brand awareness with our end consumers. The Beyond Burger is now carried by approximately 11,000 grocery stores in the US. Interestingly, a Kroger study reported that “93% of Beyond Burger buyers over the 26-week period ended June 30, 2018 also purchased animal protein during the same period”. According to Fitch Solutions Macro Research, the meat industry in 2017 generated $270 billion in retail sales in the United States and $1.4 trillion globally. Reflecting the strength and value of the Beyond Meat brand to its partners, many of our restaurant, hotel and other food service customers choose to prominently feature our brand name on their menu and within item descriptions, in addition to displaying Beyond Meat branded signage throughout their venue. We believe that we have established our brand as one with “halo” benefits to our partners, as evidenced by the speed of adoption by key partners. For example, Beyond Meat was the fastest new-product launch in the history of both A&W Canada and TGI Fridays, and a number of our key partners are investing their own resources to tap into our brand and product awareness. Our products are now carried by approximately 11,000 restaurant and foodservice outlets across the United States. Beyond Meat has developed three core plant-based product platforms that align with the largest meat categories globally: beef, pork and poultry. We create our plant-based products using proprietary scientific processes that determine the architecture of the animal-based meat we are seeking to replicate and then we assemble it using plant-derived amino acids, lipids, trace minerals and water. Meats? Well, there’s the traditional players, Hormel, Tyson, Cargill and the like. And there’s been a host of new companies coming along, Impossible Foods just snagged the #1 Hottest Technology” designation in the 40 Hottest Technologies rankings — and there’s Boca Foods, Field Roast Grain Meat, Lightlife, Morningstar Farms and Tofurky, to name a few others. Milks? Again, the traditional diaries, and also the makers of Silk and a raft-full of almond-based milks. What we don’t yet know about plant-based alternatives are the limits. Specifically, the limit on the number of customers that will try an alternative, the extent to which they will make it a regular part of their purchasing routine, and the extent to which alternatives will succeed culturally and in terms of distribution strategy outside of US markets. That will tell us whether the companies will create another important niche in the US with, say, 5 percent market share like the vegetarian and vegan market commands — or whether this will explode out of a $10-$15 billion niche and into the $300B+ markets for milk and meat in the US, or even the $1.5T+ global market. Industrially, we don’t know — especially on the Perfect Day front — whether the costs will come down in commercialization to be competitive in the market, but we do know broadly that alternative milks are commanding a premium. With Beyond Meat, we’ve seen clear evidence that the company can compete on price — one reason are the extravagant processing and distribution costs already baked into the meat supply chain. The price of beef is around $1.15 from the farmer — wholesale beef ranges from $1.99 for the cheapest cuts of chuck to $11.41 for tenderloin, and there’s another big markup on the way to the retail shelf. Beyond Meat is able to integrate the first two cost centers and avoid the substantial cost of butchering. So, meat without the cow and milk without the cow have taken giant steps forward this week. How far and wide the impact — say, on grain prices, soymeal demand, health outcomes, sugar and other alt-meat ingredient prices — we’ll know in the next few years. Beyond Meat expects to trade as BYND on the NASDAQ Global Exchange; the complete IPO documentation is here.